These are just some of the things clients have to say about Karen and her services. 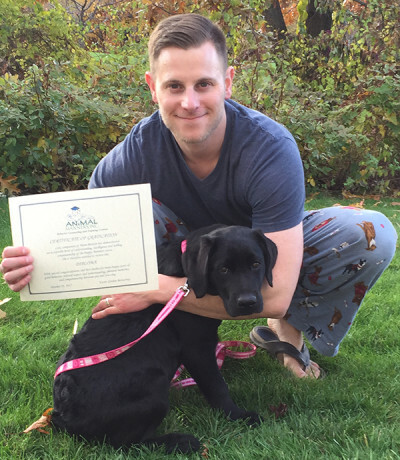 For each of these testimonials, please acknowledge the hard work and dedication of these dog owners who have proved that the success of learning is dependent upon the commitment of the owner. 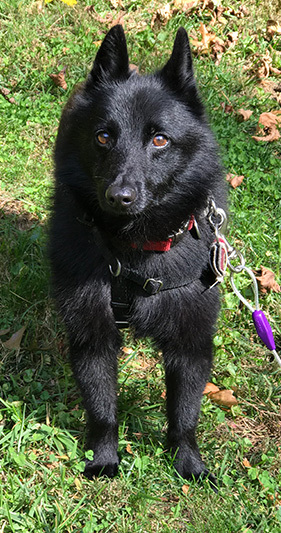 Karen worked wonders with me and my 7 year old skittish Schipperke rescue – Skipper. I had Skipper in my home for about one month when I realized I needed help. Animal Manners was recommended to me by a co-worker and it was the best call I ever made. 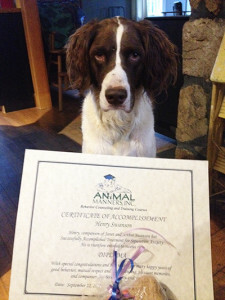 Karen understands animal behavior and knows how to train the humans! The positive reinforcement tactics she taught me to use, and her ability in helping me really learn how to apply them to best support my dog, were wonderful. She encouraged me to have patience in the training process and was there “outside” of our scheduled sessions to help me when a new crisis came up (like my dog becoming afraid of his food dish or refusing to walk on his leash). She has multiple “tools and tricks” that she works with you on to find the right solution for your pet. If she recommends your dog go to daycare – do it – I was anxious at first since my dog had escaped from my home 2x but Karen convinced me he would be safe and thrive in interacting with other dogs and she was right. I went with her recommended facility and it’s been wonderful. When our training sessions ended I felt equipped to deal with Skipper’s skittishness. It’s been 18 months now and I still have Karen’s lessons in my head and apply them when I have a new issue with my dog (or an old issue resurfaces). Hope you’re doing well. We welcomed Brody Mason Ortlip to the world on Friday, 10/28. We’re all doing well (including Macy!) and adjusting to our new routine at home. Macy has been great. She stayed with Bibbit’s mom while we were in the hospital and then for our first two nights at home so we could get the hang of the newborn routine. She was excited to see us when she finally came home and also excited to meet her new brother. She was curious but respectful and I think from the onset knew Brody was a new member of the family. She’s been very sweet with him and gives him little licks when we allow but is not super invasive of his space at all. She also doesn’t blink through crying diaper changes or fussy nursing time and more or less appears to be taking all the changes completely in stride! Thank you again for all your help. It’s been a good transition so far and we couldn’t have done it without you! Attached a few pics below of Brody’s first days in the world. Karen is extremely knowledgable. She does NOT bully your beloved furry family member or show him who’s boss. She shows you how to understand your dog, and shows your dog how to do what you need him to do. Karen’s methods are kind, gentle and completely effective. A Note I just had to share! Happy New Year to you and your family. Hope you all also had a Merry Christmas. We had a great time with kids and grandkids, and Annah was the center of attention. She has really settled down and is sweeter than ever. She is calm and obedient around everyone who comes to our house. She is in a “Down Stay” near us every night at dinner, and was the same way with a crowd over for Christmas Dinner. She has become so affectionate, knows most of her commands, and is no longer jumping and snapping at us out in the field. In short, we couldn’t be more pleased with her. Thank you so much for everything you did for her, and for us. It is really paying off. We came to Karen in April of 2015 to help us with our 7 year old dog, Henry, who was experiencing extreme separation anxiety. We worked extensively with Karen for five months and in September reached our goal of being able to leave Henry alone for four hours! We could not have done this intensive behavior modification without her expertise. Thank you so much for giving Henry back his life, as well as ours! 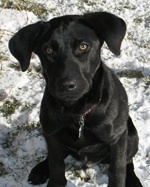 We adopted our labrador mix, MoonPie, from a rescue in Tennessee. She was found laying on a four lane highway, pregnant and thin. A compassionate woman rescued her and took her home. When she arrived off a transport truck, we knew we had a sweet dog but needed the right trainer. She had been through so much we searched for a positive trainer who could teach us how to develop our communication and trust with our dog. Enter Karen Gordon Betournay of Animal Manners! Right from the start Karen showed us her positive training techniques that seemed like a miracle. Moonpie responded enthusiastically at every turn. 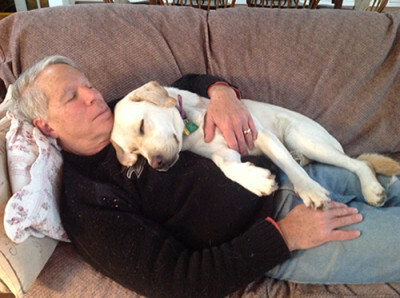 When we bring a dog into our life we believe it is a long term commitment. Spending time with Karen taught us how to reinforce the behaviors we wanted. Karen is such a competent and organized trainer, she made all the difference. She arrived on time for our lessons and was incredibly prepared for each time. 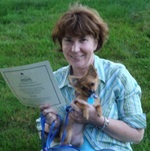 I have worked with many dog trainers in my life and Karen is simply the best. After each session we had fun homework for the entire family to work on between our meetings. This helped us to stay engaged with Moonpie and reinforce the behaviors we were building. We did have our challenges with Moonpie’s fears, but Karen was able to problem solve every issue. Today, one year later, with Karen’s guidance, MoonPie is a certified therapy dog! She brings love and compassion to people who are homeless residing at a local shelter. 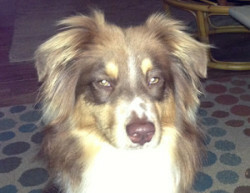 We highly recommend Karen Betournay, for any canine. Whether you have a new puppy who needs to learn the basics or an adult dog needing some help reinforcing behaviors, Karen is the right choice! We give Karen five stars!!! As a busy, three doctor practice we encounter a variety of behavioral issues, both large and small. 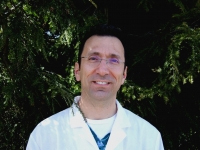 We pride ourselves on the level of care and service we provide to our patients; we expect the same from the people with whom we refer and partner. Karen Gordon Betournay at Animal Manners always exceeds our expectations. The dogs respond to her patient and caring manner. Clients find her approachable and her expectations reasonable. 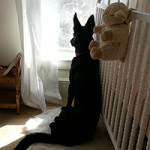 She is our “go to” resource for all our canine behavioral challenges. 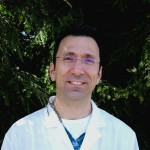 We wouldn’t trust out our patients and clients to anyone else. 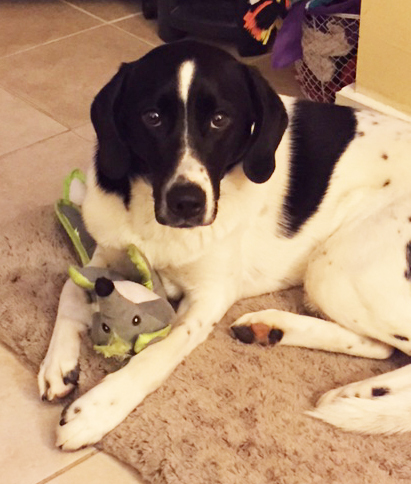 When we decided to rescue a dog that was described as “difficult” we knew we were in for a challenge, but Sable ended up being far more than we bargained for. After finally admitting that we cannot do this on our own we contacted Karen at Animal Manners. 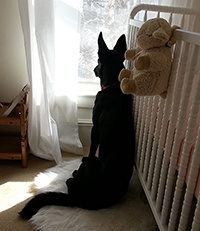 Karen’s calm, caring and patient demeanor with Sable (and us) has helped us earn Sable’s trust and gave us the skills to turn Sable into a loving and loyal companion who is eagerly awaiting the birth of her future best friend. I forgot how much. work puppies are! We moved into a new house, picked up a two month old puppy, and celebrated Christmas all in the same week. Christmas over and the house under control, I decided we needed to get the puppy under control. Karen stepped in with her quiet voice and gentle ways and within weeks everyone was much calmer. Puppies learn very fast and without some direction, not all the right things. Of course, we needed some management also, We needed to give up the “no” word and replace it with positive reinforcement and lots of ” good girls’. It worked, we have a pretty good-mannered puppy, we are a work in progress. Years ago, we’d taken our Rhodesian Ridgeback mix puppy, Chance, to a local dog trainer for basic obedience lessons. At the time, we also had an older Collie mix with an extremely calm, compliant temperament, but we wanted to get the new pup off on the right foot and thought we could use a refresher course ourselves. After some convincing, we conceded to the trainer’s methods of using a prong collar to issue “corrections” but after some time expressed alarm that Chance was exhibiting early signs of fear-based aggression/reactivity (towards other dogs). Our concerns, however, were dismissed as “normal” behavior and unfortunately the situation only worsened. Finally, after attending several of the trainer’s group classes for “problem dogs” only seemed to deepen the problem, it became clear that we needed an entirely different approach. With positive training techniques, a humane, no-pull harness, and a combination of private and group lessons for reactive dogs, Karen helped us to better understand and manage our boy’s issues, and these days he’s an easygoing guy so long as we don’t put him into situations that will overwhelm him. Sadly, we truly believe that positive training would never have exacerbated his reactive behavior in the first place, and that when our initial concerns were summarily dismissed we missed a short-lived opportunity to give him the tools he needed to feel confident and secure, and to move forward in a positive direction from the earliest possible age. What we’ve come to appreciate, and hope others will as well, is that “correction-based” training reinforces negatives by marking “Do Not’s” and in doing so inherently undermines the bond between the dog and its owner. And when employed with a dog with innate behavior and/or confidence issues, the combination can be disastrous. In contrast, positive training capitalizes on dogs’ natural social instincts and desire to please, while building the animal’s confidence and deepening the bond between dog and owner. Lesson learned: We adopted another puppy last year (a Bahamian Potcake), and with Karen’s instruction Marty is growing into a well-adjusted (and increasingly well-behaved!) dog who handles a broad variety of social situations with ease. Thanks, Karen! We called Karen to help us train Milo, our newly adopted rescue dog. We were only familiar with a correction based approach to training, so “No Milo” were the two words being used most frequently prior to calling Karen. She taught us to train him with a positive reinforcement. We were skeptical that Milo could be trained with praise and rewards but Karen’s training methods worked so well that a year later when we rescued another dog we called her again. 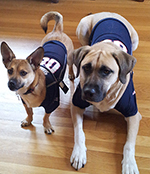 Milo and Bean are happy, well trained members of our family , thanks to Karen! I came to Karen seeking help with Auggie’s fear aggression challenges, particularly with his fear of men. I had tried a few different training methods and worked with another prominent trainer in the area, only to find that Auggie’s behavior seemed to be staying the same or getting worse. When I first got Auggie, my first dog, at 8 weeks I was determined to only use positive reinforcement, however was guided down a path of using choke collars and a firm, aggressive voice when he would act out towards men. This seems to have only heightened his fears and I was struggling with the negative relationship I seemed to be forming with my best bud. Karen has done a great job to educate me as to why positive reinforcement is a much better method and why the dominance theory just doesn’t work. After only two sessions, I have seen great improvement with Auggie’s behavior around men. While we are still working to adjust the balance, especially at home, he has become less anxious and fearful. And our relationship is becoming more balanced. Thanks so much, Karen! I’m a positive reinforcement proponent for life and will recommend you to any dog owner I run into. I have used Karen’s services exclusively for her testing finesse with regard to “puppy assessments” on each of my litters. Karen is very careful, thorough and truthful in this regard. She is quick to pick out the pups that need more attention or social skills and that is a critical point for a pup to become successfully placed. Karen’s training credentials give her a unique insight to possible placement issues when perusing my applications for each puppy. Because of her suggestions, I have had a very high “perfect home” placement record. When my clients ever have a question about their puppy’s behavior development, I know that Karen’s expertise will provide the answer. I consider using Animal Manners a valuable asset to my breeding program and my clients are always impressed that I provide this service from such a qualified individual. Thank you so much for sending us these pictures. You can see how much Hershey adores you by the way he’s looking at you! We can’t thank you enough for all that you taught our family and for your patience dealing with new dog owners! You’ve given us a lot of tools, confidence and common sense. We’ll be practicing all summer and looking forward to our next group of classes! I met Karen 9 years ago when we acquired our first Yorkie, Angus. I had always been around animals growing up, even doing dog obedience in 4-H, but it had been a while so I thought I could review how to “train“ Angus. We did a full 6-week obedience course. When I first got Koda at 10 weeks, I knew I wanted to get started on a good first step (paw) in training. Working with Karen was the best thing I ever did. Her gentle manner and training with my dog as well as myself was a great start! Bravo Karen! Because of working with you, Koda is one of the calmest Westies in NH. 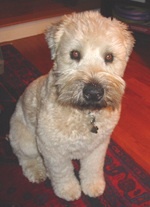 Karen was instrumental in helping me help Henry, my wild Wheaten terrier, learn Adult Manners. He was 10 months old, not neutered, and used to the free and easy “dorm life”—a challenge to say the least. Henry respected Karen from the moment he met her, and responded well to the positive renforcement method of training she taught me. He’s still wild, but in a much more respectful way, and we have the foundation for a lifetime of learning together. We volunteer with the ElderPet program as a Delta Society Team—great fun. Karen has trained us along with our many dogs over the years. Her calm and consistently even demeanor are marks of her professionalism. I have referred many friends to Animal Manners. 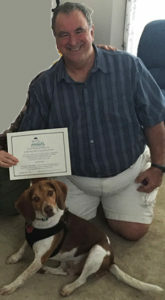 This behavior-based training respects the animal and the relationship that animal has with the family, human and canine. At fifty years old, my husband and I became first time dog parents. We are so grateful for all that Karen was able to teach us, and Regal the Beagle. This dog is such a delight to the whole neighborhood. I’m not exaggerating—I walk him around the block and children call his name and come running out to him. I love this dog so much, I could have easily spoiled him into a creature that no one wanted to live with. Karen, you really taught us how to understand the dog, and how to get him to understand us. When there’s a loud noise, like thunder or firecrackers, Regal’s reaction now is to look at us. When we don’t get excited, neither does he. This dog was returned to a shelter twice before we adopted him. 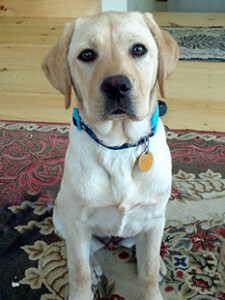 He was not a new dog when Karen came to help us train him, but he learned quickly under care. The money spent on individual training was well spent. I have since talked to many people who said their dog didn’t really learn much of anything in group obedience class they attended. I can’t begin to calculate the value of the increased enjoyment we get from this dog because we can really communicate with him. If we ever get another dog, the first thing I’ll do is call Animal Manners. In July 2000, my family decided to ”foster“ a German Shepard/Husky mix from the shelter. We named her Bella on the way home, need I say more? Our veterinarian estimated her age to be 3 years old and she clearly hadn’t been trained. We weren’t sure what to do, and Bella needed direction. My sister told me about Karen because she had two dogs that Karen was able to teach/train compatibility to. We had Karen come to our home for one-on-one training, which I must say is incredible! It is stress free for your pet, and being in the home is perfect because this is where all the training happens. Karen’s positive training techniques coupled with her insight and calm demeanor were exactly what Bella needed and responded to. She learned quickly and easily because of Karen’s patient, reward-based methods. Sadly, our beloved Bella passed last summer…a truly heartbreaking experience. When I informed Karen of Bella’s passing, her compassion, kindness, and understanding was genuine, and it was a comfort to me. In fall of last year, we found ourselves ready to take on adopting another dog, Sophia. 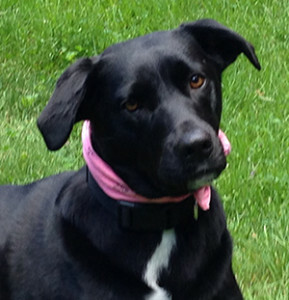 Sophia came from Alabama, is 3 years old and had no training at all…she wasn’t even housebroken. We tried to train her at first, and this only led to frustration and anxiety for us and Sophia. I called Karen. Once again, Karen’s techniques have been 100% successful! Sophia is a great little girl and we have become a family together. I would not hesitate to recommend Karen to anyone. Regardless of what is needed for training, she has the answers—they are kind, respectful and proven successful. As a person that has never had a pet, I hired Karen not only to train my new puppy but to train me. Karen’s soft-spoken and gentle way with Sophie, my Shih Tzu, was such a surprise to me. She managed to teach Sophie many commands with a soft, subtle way. 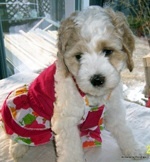 I wanted to have a good experience as a new dog owner and Karen was able to make that possible. You were wonderful helping us with our baby Berner Clementine. 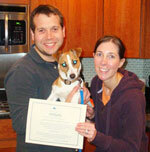 As first-time dog owners, you provided us with the necessary answers to understand our newest family member. When we met, she was about a 14-pound 10-week-old puppy trying to figure out how to keep her legs under her. It was a pleasure having you guide and train us with her and you did it with your knowledge, TLC, and humor. Your expertise and helpful tips worked well. In addition, you were just a phone call away, available when we had questions between sessions in your reassuring manner. As the youngest member in our family, she’s grown to be a 75-pound, well-mannered Berner. Karen not only teaches you how to train your dog but she teaches you about dog behavior and the human-canine relationship. This gives you a greater understanding of training techniques, which helps you train your dog more efficiently and build a great relationship with your dog. 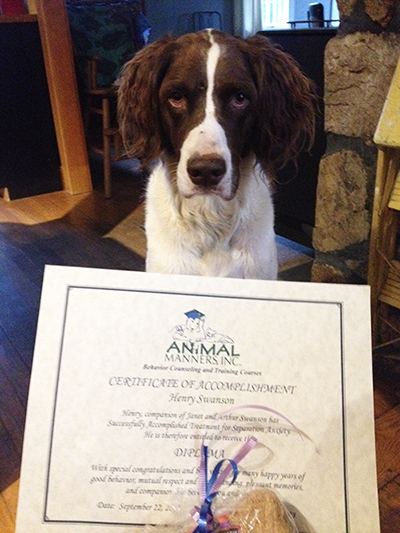 Thanks to positive reinforcement training, my dog Aspen loves to train and learn new things. A few months ago I got the most adorable little Chihuahua, against the advice of many. I immediately called Karen at Animal Manners, and in 6 easy lessons I now have the sweetest, completely socialized little puppy. She is like a little dream, very well behaved. We got through all her little annoying puppy stuff so easily. I really enjoyed working with Karen because her approach is gentle and positive and I think my puppy learned faster in that environment. I just wanted to let you know how much I appreciate your work and how much Oscar learned from you. Keep up the great work. I wish you trained for show. As Oscar enters his teens I’m sure I will be begging you for help….I’m keeping my fingers crossed that he won’t be that bad. Anyway, thank you again for a job well done. We were hiking at Diana’s Bath with our two Beagles (Missy and Bella) when we met Karen and her family. We stopped for a few minutes to chat and I was immediately impressed with Karen’s kind, gentle manner as she spoke to two frisky Beagles in the woods! Karen asked if she could photograph our Beagle girls, then much to our surprise we learned that she was a professional dog trainer! We were very excited when she asked if she could use the girls in a photo shoot modeling dog clothes. Creativity is the key to keeping Beagle girls happy and with all the snow this winter Karen’s email for the photo shoot arrived at the perfect time. We did not know what to expect when we arrived at the studio, but my heart and mind were open. It was one of the best afternoons I have had in a long time! Watching Karen work with Missy and Bella brought pure joy to my afternoon. Karen’s God given talent was evident from the beginning. Her professional and gentle manner had the girls eating out of her hand within moments, and as they followed her around the studio their tails could not stop wagging! They were having a blast! Beagles love to work and Karen worked them with gentle guidance. I never heard her speak to them, if she did it was in a whisper, and they obeyed her every command. She dressed them in many different outfits and different poses, each outfit and pose more precious than the one before. I had no idea how much work was involved putting together photographs for pet catalogues until I watched the crew at work! Karen took time to teach me a few new tools to give Bella a little more direction. I have enjoyed putting these new techniques to work and Bella has responded beautifully. Meeting Karen Gordon Betournay of Animal Manners, Inc. and watching her work with our Beagles has been one of the nicest experiences I have had in a long time. She treated our girls with respect and they responded in kind. Karen is a true credit to her profession. I highly recommend Karen, her compassion, kindness and understanding of our dogs was genuine. Thank you Karen, it has been our pleasure. When we first got our Jack Russell Terrier (Trevor) a close friend recommended the services of Animal Manners. Karen was such a welcome help when it came to training Trevor, as he has a lot of energy. The tips and techniques that Karen provided during the in-home training made all the difference. When the course had come to an end I do believe that Trevor missed seeing Karen each week. We can’t thank Karen enough for showing us that speaking calm and confidently goes a lot further than screaming and yelling. Trevor is turning into a wonderful Jack and we Karen to thank for getting us off on the right foot!